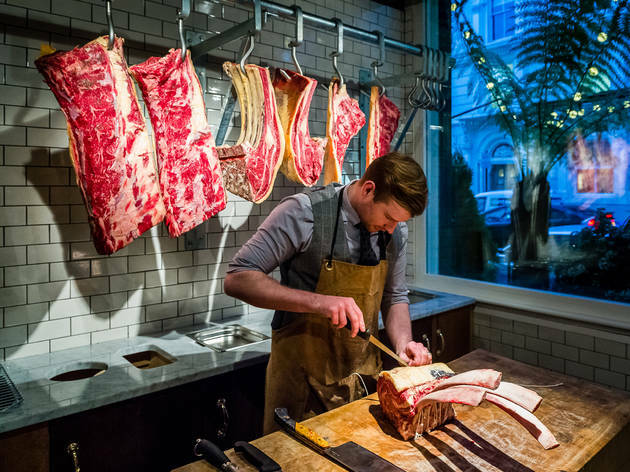 A third London branch from the steakhouse group specialising in under-used cuts. It was a cold, drizzly Wednesday night. It wasn’t even 7pm. Yet here we were, standing in the doorway of the new branch of Flat Iron, being told the wait for a table would be an hour and 20 minutes. ‘One hour and 20? !’ we squeaked, aghast. 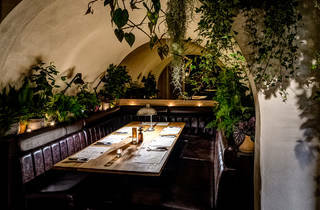 Still, there was a silver lining: this Covent Garden outpost of the hip steak hangout – the third one to date – has a long, shiny bar serving long, shiny cocktails, so there we waited. As ways to kill 80 minutes go, it’s not too shabby. Our cocktails, chosen from a short menu of with-a-twist-classics, were rustled up by a cheery bartender who stayed smiling when we nearly forgot to pay him. A blood orange old fashioned saw its bourbon base deliciously spiked with smoked demerara syrup and blood orange oil; of this kind of tinkering with drinks, we approve. Before we knew it, an iPhone was buzzing, the time was up and our table was ready. 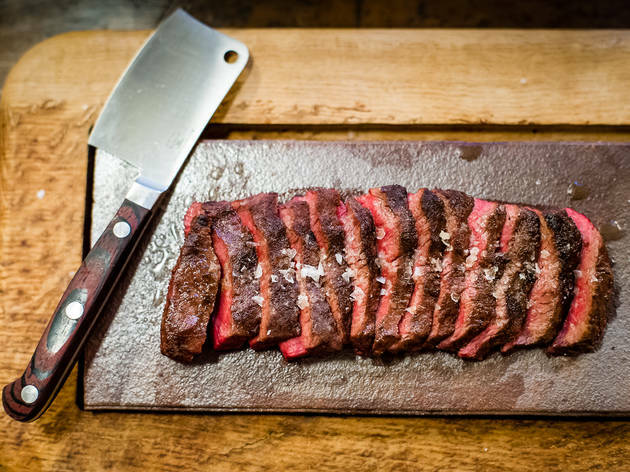 The beauty of Flat Iron is that while it’s no bookings, it’s also no choice. Which means that even if you do have to wait a while to be seated, the moment you sink your bottom on to a chair, you can go straight ahead and order. Sure, there’s the occasional blackboard special, but essentially the deal is this: one steak (a ‘flat iron’, the US term for a full-flavoured but affordable leg cut) for £10. It comes long and thin, like a deboned rabbit, then sliced into fat little mini-slabs, on a slate, with a dinky pot of lamb’s lettuce that’s more garnish than salad. Proper sides (crispy fries, steamed greens) are only £2.50 a pop. Everything we ate was just as it should be – which, when you factor in affordable wine (with plenty by both glass and carafe) and friendly, helpful staff, makes for a pretty good deal. Then there’s the charm-bracelet-sized cleaver (a replica of the one provided for eating) they give you when you’re finished, so you can either grab a scoop of salted caramel ice cream with chocolate shaving from the ice cream bar as you leave or – if you’re local – ‘cash it in’ another time. Finally, the large, stylish space: a failsafe combo of wood floors, exposed brick and designer lighting with a few Theatreland quirks (such as arches leading to more intimate ‘nooks’). All in all, it adds up to a great, and great-value, night out. No wonder there’s a queue. Best value steak and chips in town and the tastiest! Go for the traditional flat iron and chips! Sides creamed spinach is a must! I’ve been to a few branches and service is always very good! Due to the popularity, expect big queues, but it’s ALWAYS worth the wait! Covent Garden is bustling in November, thank goodness, because having put our name down on the evening list just after seven o'clock, we were told it would be a wait of over two hours! I don't ever queue for food but with an array of stalls and pre-Christmas activities, I wondered off. Putting aside the ridiculous wait the dining experience was fabulous. The very limited menu means that once seated and having ordered, the food arrives quickly. As you can imagine, I was hungry. The burger a special, was huge and delicious with a bun that didn't fall to pieces. At £10 it was a gift. It came with no accompaniment but the sides of purple sprouting broccoli and chips at around £3 each, were beautifully cooked and good-sized portions. My daughter's steak was cooked to perfection. Service was prompt and ultra friendly. The enamel mug filled with popcorn made a pleasing change to bread or olives. The mini axe-like steak knives were a pleasure to use. You show your bill on your way out, and are given an ice-cream in a cone; salted caramel covered in quality chopped dark chocolate. A great way to walk towards the underground. Fabulous food. Fantastic pricing. Great ambience with space and wonderful service. What's not to like? I've heard countless good things about Flat Iron and it lived up to its hype. The staff were lovely and the food was incredible, this is a must go if you are looking for great food. The majority of the menu is gluten free which made ordering super easy. I went for the steak (obviously) with bernaise sauce, creamed spinach and beef dripping chips. Everything was just incredible. Not too salty, melt in the mouth meat and gorgeous tangy sauce. 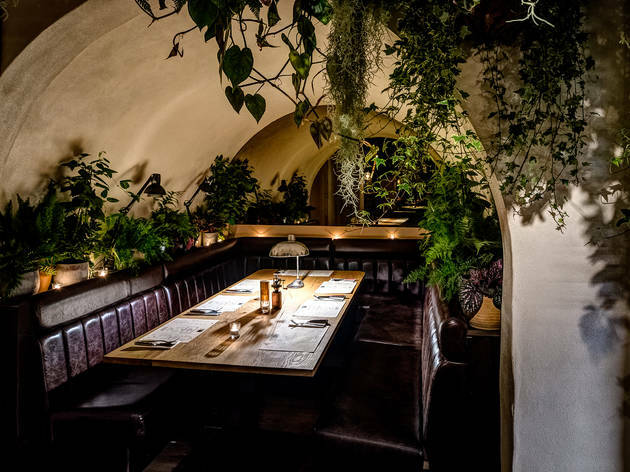 The one down side about Flat Iron is that it is SO popular that if you want to go at dinner time, chances are you won't be getting a table or a couple of hours. We went at lunch and the wait was only 20 minutes so I would recommend for chances of getting in go during lunch. The food came fast, we were absolutely stuffed and I'm already jumping to go again. By now, I am sure Flat Iron needs no introduction. It may not be the most prime cut of steak, but it's looked beautifully every time. It's juicy and goes well with the complimentary salad on the side. The fries are always a must, but the parmesan roasted aubergines are also delicious too. I appreciate the popcorn snacks they provide before your meal arrives because I was famished. 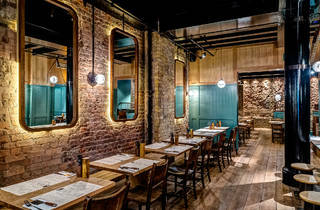 I love the decor, too, with the exposed brick walls, dark furnishing and light bulbs that are suspended overhead. Very hip. As you know, Flat Iron operates a walk-in only policy and waiting can take up to 70-80 minutes. I recommend getting their way ahead of dinner time and putting your name of the waiting list before heading off to do a spot of shopping or sinking a few drinks at nearby bar/pubs (Covent Garden obviously has loads of these so you're in good hands). There's a decent selection of red and white wine to go with your steak (obligatory, right?) and I love the fact that they give you complimentary ice cream ONLY at this branch when you finish your meal. The reason behind is lost on me sadly, but it's got something to do with the history of Covent Garden. Great place to catch with friends or a date and for those who fancy steak but on a bit of a budget. There aren't many affordable steakhouses like Flat Iron and this goes to the top of my list of affordable steakhouses to eat in London. Flat Iron made me really happy and definitely lived up to the hype. The queue outside is off-putting (it went down the road) but the wait is worth it. I had the Flat Iron and I can see why they named the restaurant after it. It was cooked perfectly and was more tender than some of the fillet steaks I’ve had in the past. Not only that, it’s so cheap and the drinks and sides are reasonable prices too. Not a bad word to say about Flat Iron, apart from - why does it have to be so popular? An absolutely delicious steak! 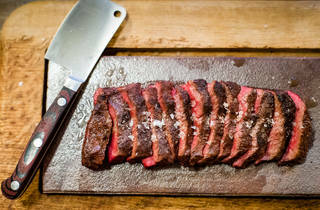 One of the best deals in London - for £11, you get a beautifully prepared flat iron steak with salad. I had mine medium rare and it was divine! My friends and I also got a side of Chips and Creamed Spinach to share. Both were excellent! I loved how crispy the chips were without feeling greasy or oily. The creamed spinach was exactly how I used to have it growing up in France and that brought back so many lovely memories. It's done well, not too creamy, and it's flavourful! A perk of this Covent Garden branch is the complementary ice cream at the end of your meal. You can have it to go or bring it back to your table to enjoy. Too full after your meal? No worries! Your receipt lets you come back at any time to claim that ice cream. My friends and I opted to sit in to have it, as it was a little chilly outside and so we could savour it. It's a lovely flavour of salted caramel, which I don't normally enjoy but this version isn't too salty nor does it have a particularly strong caramel taste. It's then covered in chocolate shavings, if you wish, which gives it an added layer of texture and crunch. I liked the cone bit as well as it had a really smooth surface and crunchy. In addition to ice cream for dessert, you get some homemade popcorn when you're seated, which is really tasty as it's made with beef drippings and thyme salt - a wonderful combination! Be sure to arrive earlier than you want to have your meal, as the virtual queue is long! My friends and I waited 45 minutes, which isn't too bad considering customers were being told that the queue was 2 hours, as we were leaving the restaurant! Once you arrive, they take your details and they'll send you a text when your table is ready. The wait isn't so bad as there's plenty to do in Covent Garden while waiting. We decided to grab a drink at a bar nearby, which was just enough time. Probably the best quality steak for the money in London. And I don't say that lightly. Be prepared to wait 40 minutes for a table unless you get there for about 4:30pm. It's worth the wait though. 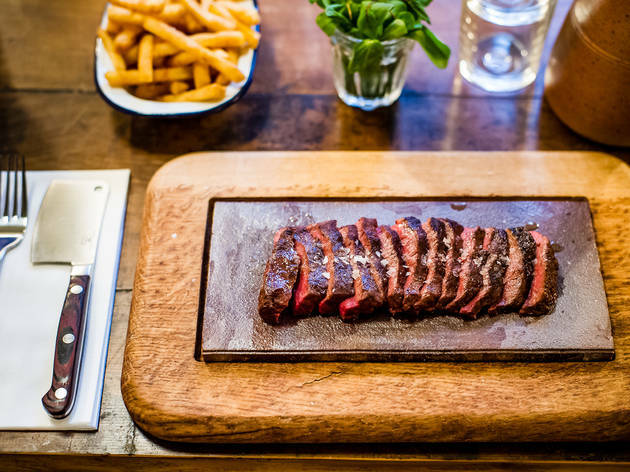 Their classic flat iron is a simple steak cooked beautifully and for only a fraction of the price that you usually pay in London. Go right now. We went to Flat Iron Covent Garden last night (14th December) for our annual Christmas meal and had an amazing time. It's our third year in a row and last nights was the best yet. There can be a little bit of a wait as it's so popular and they don't have many tables for groups but it's always well worth it and the great barman making fantastic Old Fashions means that the time flies by. The waiter was great fun, manager friendly, food amazing, perfect minimal menu with just one type of excellent steak so no long debates about over-priced Chateaubriand. I've been to a lot of steak restaurants in London and this is by far my favourite. Even the creamed spinach is amazing and the free ice cream, served with a smile, rounds the meal off perfectly. I'd wanted to go to Flat Iron for ages but was a bit put off by the queues at their smaller branches so was so happy when the big Covent Garden one opened. I've been here both with groups and as a couple and both experiences are excellent. I can't recommend it highly enough. Can't fault Flat Iron on their food, their menu is super simple and it's definitely worth a visit if you're looking for a good piece of steak at a bargain price. The only downfall to Flat Iron is the absence of a booking process. The restaurant doesn't accept bookings so you need to get your name on the list when you arrive. We went to the Covent Garden branch on a Monday evening after work and had to wait an hour and a half for our table so we dipped into a nearby bar for cocktails. In fairness, they send you a text as soon as your table is ready but it'd be so much easier to just book a table in advance. Great food at a great price if you're willing to wait for a table - the complimentary ice cream at the end of our meal was a nice surprise and a lovely treat on the walk home. 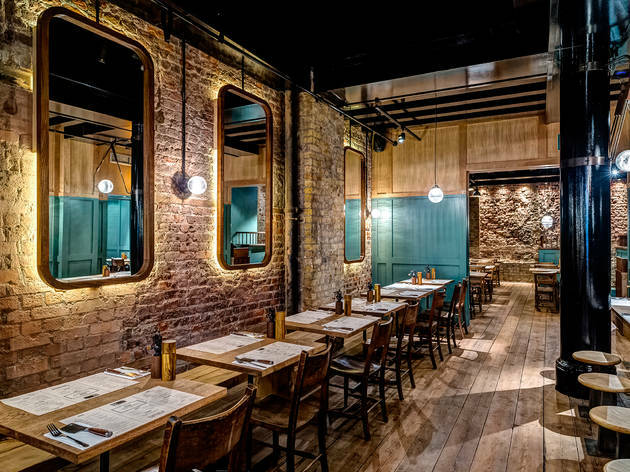 This little steakhouse is discretely tucked away between shops in a thoroughfare in Soho. No bookings can be made here; however the staff will take down your details and contact you when a table is ready - if there isn’t an available table already. Once you’re seated in this small restaurant, the waiters make sure that you feel special by constantly checking up on you. The menu is concise - with 2/3 steak or meat options to choose from. The sides vary from potato chips to a delicious aubergine roast. The meat arrives on a heated plate and the sides come in a cute little dishes. Everything is delicious! I love this restaurant - having gone there twice I’ll be sure to visit again! Flat Iron is a concept restaurant but a very decent one of the kind. The concept builds around great steak with only a few sides to choose between. We went to the Soho branch on a weekday and were quite lucky, as we got a table within 5 minutes (usually there is quite a queue). The starters we went for were all very good but to our disappointment, our otherwise tasty steaks were not cooked medium rare like we requested. They were both rare which for us was not really problem as we also like a rare steak, but it is a problem when you think about it, because that’s what the concept is all about, it’s the main element of their menu. We didn’t bother sending them back as we were starving but did tell our waitress after. She apologised but we still payed full-price for something we didn’t order the way it was served to us. A really nice after-dinner surprise was the free ice cream at the end. Flat Iron doesn’t have desserts but on your way out you can redeem your receipt in exchange for a free cone of ice cream, which is a lovely gesture and a nice way of saying thank you to customers. The dulce de leche flavour dipped in dark chocolate nibs was just amazing, the best thing you can have after a filling, meaty dinner and a nice epilogue to our visit. Flat Iron is brilliant. Reasonable, high-quality food, an unpretentious wine list and personable service. The only the fault is caused by its popularity - they don't accept bookings and you have to sign up to their waiting list before getting a table. Regardless, I love the relaxed atmosphere their restaurants offer and the £10 steaks are perfectly cooked. Struggling to think of somewhere to go with my Dad, who purely loves meat, I attempted to try Flat Iron for the first time. Worrying I wouldn't get in, based on the fact you cannot reserve, I was over the moon when we were shown straight in! After ordering a delicious carafe of red, served in a very cute old fashioned milk bottle and tumblers, a very friendly waiter came to explain the menu to us. Basically, all they serve is flat iron steaks, with the exception of some specials which on this day featured a burger and a sirloin steak. But considering the place is named after the cut of steak it serves, we both plumped for the flat irons. They come with a side salad, so we ordered two portions of duck fat chips, creamed spinach and the blue cheese salad. And the sauces we had were bearnaise and Fred's sauce, which was described as a spicy bloody Mary sauce. First things first, the steak was beautifully cooked. They recommend medium rare, which was perfect. The meat was juicy, flavoursome and the fact you can use a mini cleaver to cut it was adorable. The sides were all amazing, and you could probably get away with sharing them all. The chips were moorish, the creamed spinach was heaven and the blue cheese salad was full of flavour. After demolishing it all I could not eat the side salad that comes with it, but it looked lovely. If you want a cheap, but tasty dinner head to flat iron, spend £10 and enjoy a good lump of meat. And the icing on the cake? A free scoop of salted caramel ice cream at the end. I NEVER queue for my dinner, I fundamentally disagree with it - when I want to eat, I want to eat right away. BUUUUT my friend and I decided to put our names on the list for a table at Flat Iron early, knowing we'd be happy to eat a bit later. 2 hours later, to be exact - but the good thing is you don't have to wait in the line, you can bugger off and have a drink elsewhere and they text you when the table is ready. I'm ok with that. Once our text arrived we tottered back and were shown to our seats. We ordered the classic £10 Flat Iron and a side of chips and the creamed spinach (which I could spoon into my mouth every day!) As ever, the steak was sublime and the novelty of the cleaver knife will never get old! The cheapest bottle of red is a delight too. Service was great and I love that you get a free ice cream cone at the end of your meal - it's a really simple and nice gesture for parting guests which means they always leave on a high. It tastes delicious too. I've been to the Flat Iron restaurants countless times and each time has been just as great as the last. It's a must do if you, or any other meat lovers visiting London. The only drawback is the queues which you will encounter regardless to which one you go to. Simply put your name down and head to the nearest pub / bar and they will text you when your table is free. For larger groups on weekends I'd say the wait would be around 1 - 2 hours, but put your name down anyway as people tend to drop out of the queue, and it's never that long of of wait. The Flat Iron is tender and melts in your mouth, recommended medium rare (can't argue with that) and for just under a tenner is a steal. Great choice of wines too, the Malbec is pretty good. Choice of sauces and sides ranging from around £4 mark (£1 for sauce). Great ambience, amazing value, quick service and really friendly staff. Tip: Go to the Covent Garden restaurant as you can get free ice cream at the end. I could review this multiple times because this is a not a review of my first visit, but my sixth, so it's safe to say I've had a good go at this menu. The menu is small, but I really think this is a good thing. You know going what you getting and it’s always a good choice. The flat iron steak is good, like really good, and I don’t really like steak but it’s juicy and tender and melts in your mouth just like it’s supposed to. The sides are good too and there’s always some extra using vegetables that are in season. Another great thing about flat iron is the price. It’s steak that is affordable and in London, those two things don’t often go in the same sentence. Did I mention that whilst you’re waiting you’re given beef dripping popcorn? It’s delicious. But the very best thing about the Covent Garden flat iron is the free ice cream - a salted caramel scoop in a cone, rolled in shaved dark chocolate. This is a restaurant I’d recommend and I’ll certainly be back soon. One of the best steaks in London, in the biggest Flat Iron branch. The menu is pretty simple as there is just one main course: The Flat Iron Steak. You can have it cooked as you want, but medium rare is the one recommended. Occasionally there are a couple of special mains offered. If the burger is one of them don't miss it, it's delicious. The steak comes with a small green salad as a side. But there are 6 different options of additional sides to order: Sophie's salad, the fries and the grilled aubergines are three of my favorite. Even though the restaurant is big (extends over two levels) you should expect long queues (in the order of 2 hours). However, the queuing system they have in place is clever. You give your phone number and you receive a text message with a link. The link contains live information about your "reservation" and the number of tables before you. You can check your order and wait for a table while you are having a drink at a nearby pub. Believe me the experience worths every single second of your wait. London can be a costly place to eat. Shock horror. Let me tell you something you don’t know. Well, ok, actually yeah, let me tell you something you might not know...in Flat Iron, you’ve found a place where you can get awesome steak for ten tiny pounds. Yup. A beautiful cut of meat, cooked well, served with a smile and so smack bang in the middle of London, it may as well have a bullseye on its roof. Flat Iron is such a head-nodding, back-slapping, applause-giving winner that I urge you to believe the hype and get in line now. ‘But it’s only Monday’ I hear you cry…’but it’s amazing steak for a tenner in London…’ I holler back. There are now 3 branches in the capital but this newest incarnation on Henrietta St is the biggest. Arriving at 6pm on a Friday night, tables for 2 were hitting the 60-minute wait mark – any more in your group and you’re looking at nearer 90-minutes but credit where it’s due, we were seated and drinking alarmingly quaffable Malbec only 45- minutes after giving our name & number to the beaming lady on the door. Staff were Friday-vibe cheery as they explained the menu – refreshingly brief – and delivered mugs of popcorn with a smile. Beef dripping popcorn, something new to me but quickly confirmed as a near perfect snack for soaking up the pre-dinner drinks without taking up any of that precious steak room in your stomach. As I mentioned, the food choices are short. Really short. Basically, Flat Iron boasts the Danny DeVito of menus. It’s steak. There might be a burger on the specials board but if you’ve come here and queued here and got excited to be sat here, then I know you’re here for the meat. A £10 cut of beef from the shoulder is your only option but unlike other ‘one dish’ places in London, this one knows what it’s doing. Our steaks came medium rare as suggested, were flawlessly cooked and served in juicy, tender, chubby, pink slices on a board unfussed with anything else. The quirky cleaver that comes with your fork sliced through with the minimum of bother and a generous pot of accompanying house salad was fresh, crunchy & tangy with mustard. Sides of creamed spinach and broccoli were deliciously creamy & firm and ‘Sophie’s Salad’ was generously peppered with chunks of blue cheese, candied pecans and lemon dressing. If anything can make me love a place more than a perfect slab of meat, it’s the bestowing of a free salted caramel ice-cream cone at the end of the meal. Creamy, sweet and speckled with chocolate shavings, it’s literally everything you want when your belly is full of cow but your second – and entirely separately – stomach is open for business and open for dessert. What’s extra nice about Flat Iron is that despite service being prompt, once it arrives, you’re very much left alone with no constant ‘how’s it going?’ which can often imply more of a concern with when you’ll be giving the table back as opposed to how you’re enjoying your meal. We were never ignored but we didn’t feel rushed for a second and this was much appreciated. 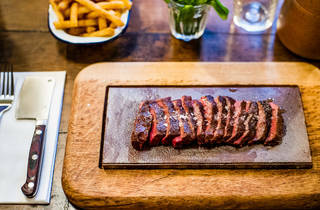 Getting any cut of steak right is something that’s befuddled dozens of other places in London but a confident streamlining of the menu here shows exactly how you should get it right. It’s brave to only sell one thing in a restaurant and a lot of the time it’s foolish, pointless or downright annoying. For every Smack Lobster or Balls and Company (yay), there’s a Cereal Killer Café or a Hip Chips (yawn). You gotta pick what you’re cooking carefully and then you’ve gotta actually make it worthwhile paying for. 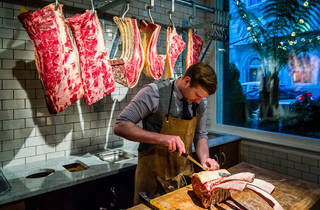 Luckily Flat Iron has done both and long may they continue to do so – the capital’s steak scene is all the better for it. Have to put this on top. I don't even like steaks. It's unusual that I would go for the steak if it's on the menu. Because I am so picky about the rareness of the steak. I don't like it too rare or too well done. However Flat Iron does the perfect medium for my liking every time I visit. If you are a fussy steak eater like me. The trick is to order it medium rare, and when it comes to the table, the hot iron plate will still cooking it till the perfect medium. Chips from Flat Iron that cooked in beef dripping are one of the best chips I have ever tasted. Creamy spinach is a good supplement to the steak, too. Don't forget to pick up your free salty caramel ice cream with Mast Brothers chocolate shaving on your way out if you are visiting the branch on the Henrietta Street in Covent Garden. Avoiding rush dining hour or prepare to wait. Service was impeccable and although having to wait for 30-45 to get a table (no bookings available, walk in only) we went off got a drink and came back and it was well worth it! A nice selection of wines and beers available to accompany the steaks! Keep on waiting... and you will be rewarded!!! The place doesn't accept bookings, but their system works pretty well - once you put your name on the list, you can keep checking online where are you in the line and they'll text you once the table is ready. So you can grab drinks and hang out in the area. And now to the food ---- truly amazing steak!! Soft and delicious, with decent portion of fries (or other side you pick), popcorn on your welcome, and a decently priced wine and drinks. Really lovely experience, underlined by super friendly staff. Worth the wait! I visited Flat Iron’s quirky spot on Henrietta Street for Friday night feasting and cocktails last weekend. Being as popular as it is, getting a table isn’t easy, and the restaurant has adopted the classic no booking policy, but fear not, you can put your name on the list to receive a text when your table is ready, and in such a prime location there is an abundance of vibrant bars to help you work up an appetite. This steakhouse exclusively serves its namesake- an unpretentious, underrated shoulder cut of beef which is also known as the ‘butler’s steak’- for no more than a tenner. The cut is just a little firmer than a fillet but as flavoursome as a rib-eye, cooked to your desire (although they suggest medium-rare) and seasoned with a sprinkling of salt. As far as the sides go we chose two portions of dripping fries (did I mention that you also get complimentary popcorn cooked in beef fat? ), gorgeous roasted aubergine and a blue cheese salad, all making great accompaniments to the steak. Four sides is more than enough between two. Last but most definitely not least, we drank the house red which was recommended to us by one of the waitresses. I am not a huge red wine drinker and I was impressed, it complimented the steak and is available by the glass for those on a budget. Flat Iron also boasts a small but inexpensive range of cocktails, ideal post or pre dinner. It is not often that you hear the words ‘steak’ and ‘cheap’ in the same sentence. Well, Flat Iron does both. It also does mouth-watering sides, beef-friendly wines, and free ice cream. I think we’ve found a winner. Best steak in the world. My husband won´t stop talking about it. We live in Norway and he´s threatened on more than one occasion that he is tempted to pay the airfare JUST to eat here. I wouldn´t stop him if he did, so long as I was invited. It´s that good. The best place for a reasonable priced but excellent piece of steak in London. I took my mother and step father here for a quick lunch. Both being normally hard to please, service was excellent and welcoming, good explaination of what is on offer and conversational. My step father thought that this would be a tough cut of meat. Even the hardest critic changed his mind once the steak was placed in front of him and he tried it. Cooked perfectly to what your request, try it with some mustard and the excellent chips....delicious. The salteed caramel ice cream for desert is a nice way to round it all off.